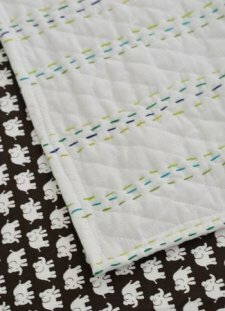 "A few years ago I chronicled how my not-nearly-a-seamstress buns were compelled possessed to make a quilt for the bean. And here I am a few years later (after a tornado of thread and a surprisingly successful sewing machine date) with another homemade quilt – this time for our baby boy on the way. "I don’t think I would have been so into making him a quilt if Clara hadn’t grown so attached to hers. She not only has slept with it pretty much every night since I finished it… … but she brings it in the car for road trips, and even drags it downstairs to to the sofa for lazy Saturday snuggling. 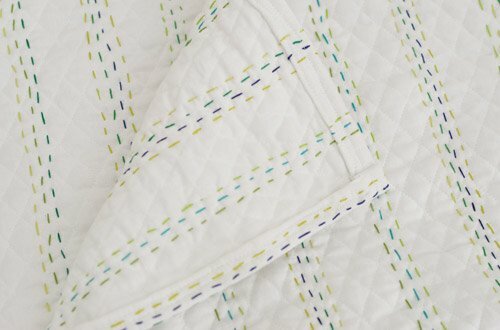 I love how charming that sweetly imperfect hand-done stitching is. Each line is irregular enough to clearly not be machine-made, and it feels so full of love thanks to those slightly varied dashes. So I decided to give it a try…"